Enough with the Salted Caramel!!!! I did a search for Salted Caramel condoms today and all I could find was this. Looks like Ghiradelli’s but it’s not! The salted caramel thing is just something for me to rant about because I’m currently unemployed and a little anxious. Sugar, salt and fat- that’s all salted caramel is. It tastes good like bacon but it’s not probably as good for you. People just keep thinking up things for us to get addicted to. Crack flavored Pringles, Methyl amphetamine Oreos. Then there’s these. These are just scraps – stuff left from the edges of the baking pan that have been fried in butter and salted. 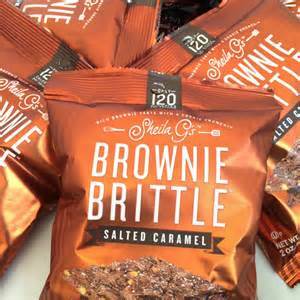 I have not tried them because I like soft brownies which are not covered with crap to disguise the poor texture or lack of real chocolate in the recipe. I have a bad case of seasonal affective disorder. I moved to Alaska for economic opportunity but that was in the dark ages before the internet. I did not know that darkness could eat away at the human brain. I love working seasonal summer jobs which means I have to find a new job in the fall, just when I feel worse for having this kind of a seesaw brain. Perhaps I just hate myself? What is there really to hate about salted caramel? It surely will become a hair color, house paint and tint for merino wool sweaters in the next few years. It’s enough to drive me to drink, but you know where this is going. 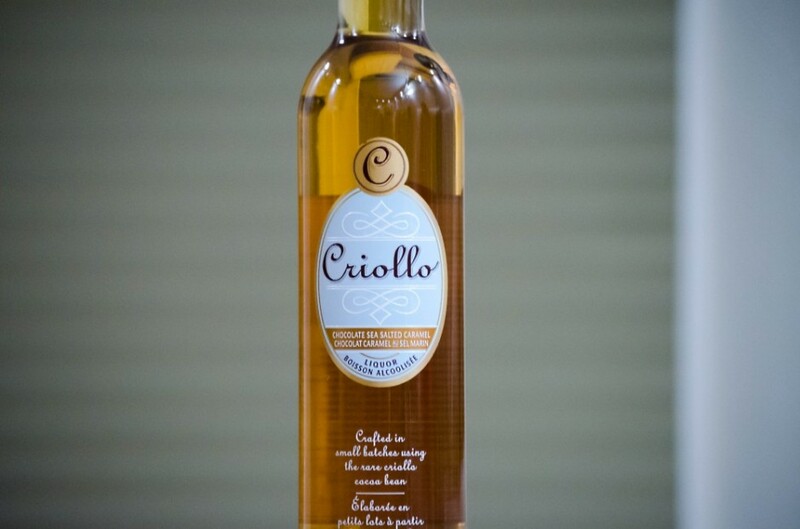 You knew there would be salted caramel vodka, along with the Captain Crunch and Fruit Loops flavors. This next one made me sad though. 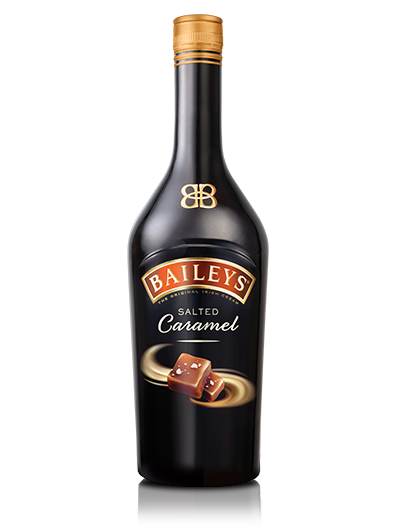 Can it really be Bailey’s if it’s salted caramel? Why not Pumpkin Spice for Halloween and Peppermint for Christmas? There is no salted caramel holiday and will never be one if I have anything to do with it. 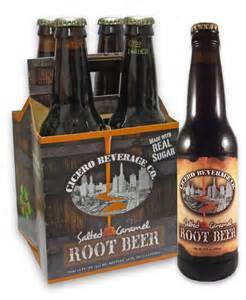 Is using salted caramel ice cream to make a float with salted caramel root beer overkill? At least it’s made with real sugar! It’s just oreos (With BUTTER) for the crust, Brown sugar, whipping cream and BUTTER for the filling then chocolate chips and whipping cream for the top covered in salt. I don’t think most chocolate chips are made with butter, probably some even more unhealthy fat stuff and isn’t whipping cream just un-whipped butter? This looks like a very easy way to kill yourself. 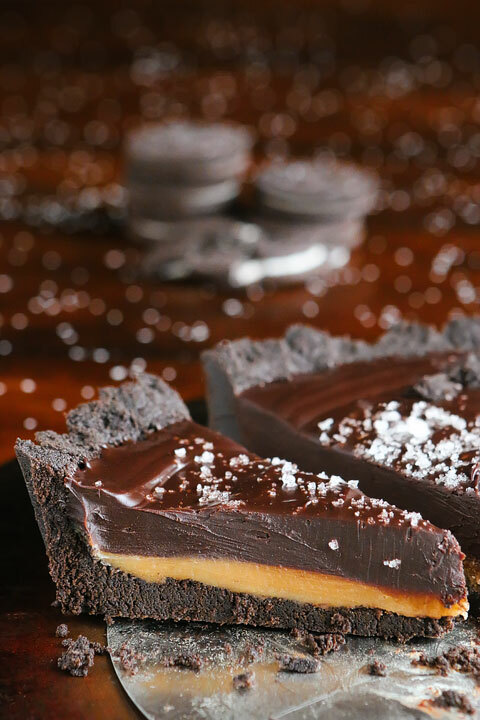 I could serve it with Salted Caramel Baileys hot chocolate and die. Then I won’t have to worry about finding a job. I have a trip to see family scheduled so don’t worry, I’m not going to off myself by mixing alcohol, sugar, salt and butter just yet. Now I can get back to worrying whether I will get a job offer then have to tell them about my trip. Posted in Uncategorized and tagged Alaska, anxiety, chocolate, food, humor, salted caramel, seasonal affective disorder, unemployment. Bookmark the permalink. I could have scanned the ad inserts from Fred Meyers and J C Penney in the local rag, The Alaska Dispatch, but this was much more depressing, right up my alley. My birthday comes but once a year and this is a marvelous way to prepare. Find all the expensive rubbish you don’t need and vow not to buy it, nor receive it. It’s like vowing never to marry, you may actually be fighting off the offers. So without ado, here’s my non-wish list. These things are crazy! Are all Buddhists nuts or just The rich American ones? These look like the bells that the Altar boys rang in Catholic Church when we said “Body of Christ.” Did Jesus/Buddha really like tinkly bells and bling? Perhaps just the priests? 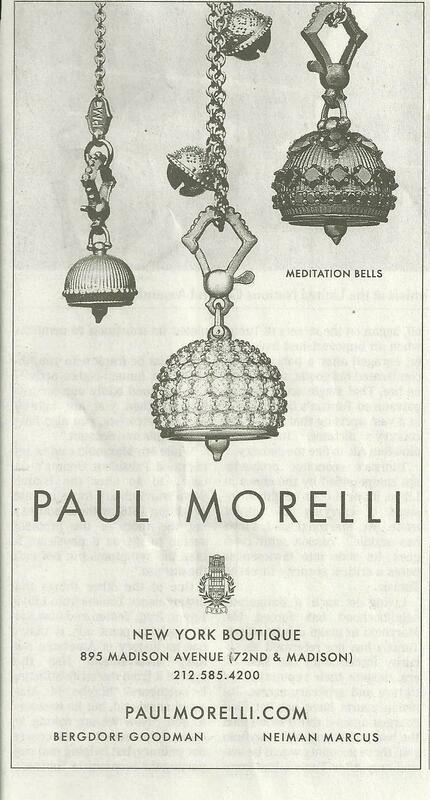 Isn’t a diamond studded meditation bell a little like a diamond studded social security card? I never understood the diamond studded crosses either. What would Jesus wear? = one more STD, one more night searching for my room in a vast sea of what looks like corridors of a state penitentiary, one more false expectation that I will meet the love of my life and he won’t have a drink and a cigarette in his hand. NO! 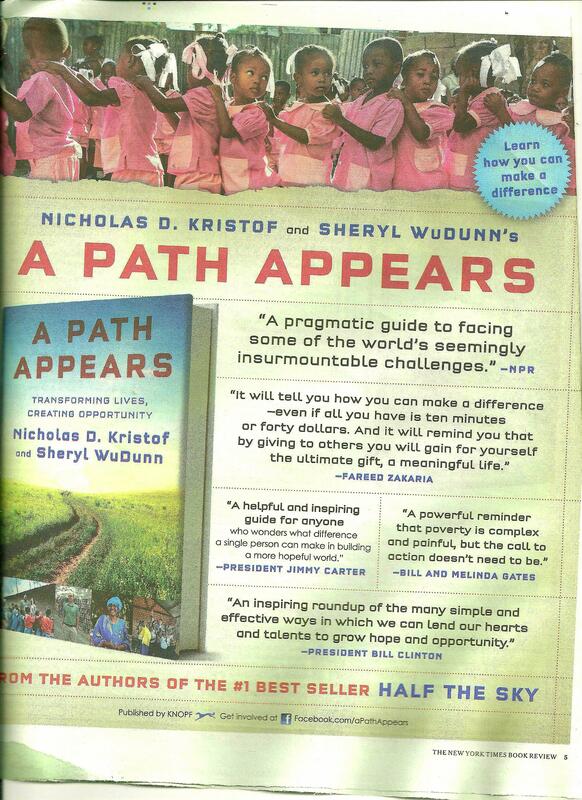 NOT Another Inspirational handbook for changing my life/the world. If I was able to help myself, don’t you think I would have done so by now? Do I still believe that helping others is going to make me happy? That maneuver gets old quickly. Why are we put on this world? Only God know, so don’t over think it. That’s my new Golden Rule. I can’t handle any more advice on how to get a man, get a job or get happy. I have chocolate for the last one and I think it may work for the other two if just I got more creative. I’m aware that escaping into chocolate won’t save the world since there are people who are actually allergic to it just like they are to gluten and exercise . I am also aware that most people change the world without ever knowing it, getting paid for, or publishing about it. NO. NO. NO! 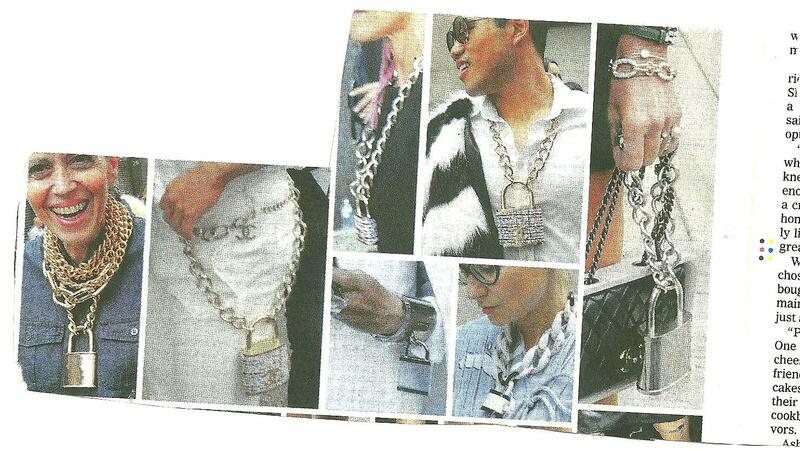 to gigantic metallic accessories! I love glitter because it is not gold. 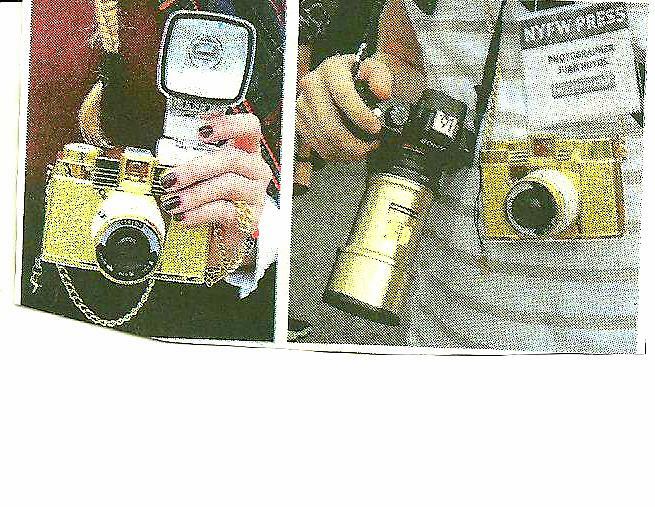 These cameras are not as funny as the Flavor Flav clocks. No they are more like golden tennis rackets or golf clubs presented to winners at the country club tournament. How would I know? I don’t know. I’m making this all up because I have issues and need to complain about something. These are classy, if you have the record to pull them off. I haven’t been to jail so I don’t think I would look right walking around with an electronic ankle bracelet or gigantic lock and chain just for fun. They look tiny here but the effect is something like observing a smiling extra in Twelve Years a Slave. Here is an entire outfit I don’t want or need. Do you? Never sit on the grass wearing white! The coat is made of white plastic so perhaps that is why the model looks so uncomfortable. She can wipe that clean but the $4000 skirt can not touch the ground. I have an idea for a TV series. Sr. Bertrille, The Flying Nun, crash lands during a hurricane. She winds up an unwilling contestant on Survivor. Would you vote her off the island and bring on the wrath of God? 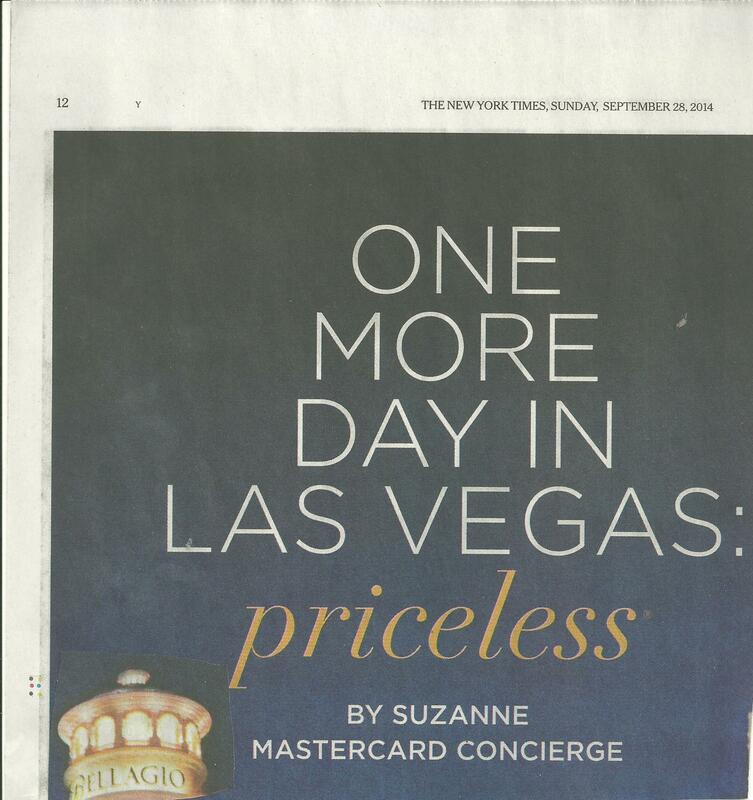 I still have lots to read of this Sunday’s NY Times so there are plenty more things to not want. I have my paper, and that will be recycled, eventually. Posted in Uncategorized and tagged anxiety, birthday gifts, books, chocolate, fashion, humor, inspirational books, New York Times, popular culture, trends. Bookmark the permalink.